Mold and mildew are often the result of excess moisture and can cause serious health problems, lead to illness in employees, excessive sick days, and lost productivity. This common progression makes it imperative to know where excess moisture is likely to occur in your Oklahoma City home or business so the necessary steps can be taken to create an effective and lasting solution. Our team at AdvantaClean of Oklahoma City has the knowledge and skills to provide successful moisture control strategies for each individual situation. WHERE IS MOISTURE LIKELY TO OCCUR? In addition to these areas, two of the most dangerous zones for moisture growth are attics and crawlspaces. ATTIC MOISTURE: Most attics lack proper ventilation, resulting in trapped moisture that can easily lead to mold and mildew growth. The AdvantaClean team will work with you in pinpointing your attic moisture issues to create and implement an individualized plan to meet your moisture control needs. 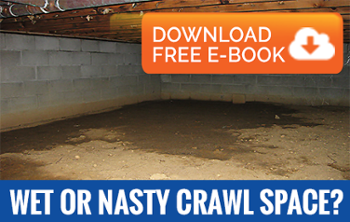 CRAWLSPACE MOISTURE: Poor ventilation and access, as well as the frequent existence of exposed earthen floors, often create moisture issues that can result in mold problems. To avoid crawlspace moisture, our team can help you implement proper grading, waterproofing systems, and other corrective measures. WHAT IS THE CAUSE OF BASEMENT MOISTURE? A damp basement is the ideal place for moisture buildup and unwanted bacteria because they are they are not properly ventilated. The lack of circulation and leaky pipes common to most basements lead to rapid buildup of basement moisture. The AdvantaClean team can expertly and efficiently diagnose and treat all basement moisture-related issues. Our personalized corrective procedures have made us the top professionals to keep your basement clean and dry! Regular deep cleaning of your basement should be the number one priority in preventing moisture growth. In the instances in which moisture growth does occur, you will need to implement effective weatherproofing systems, grading systems, and waterproofing techniques and ensure that your basement has proper air circulation and conditioning. AdvantaClean’s extensive set of basement moisture control methods and solutions will be a benefit to every residential and commercial property! If your home or business has a basement, it is likely that there is excess mold and bacteria, leaving everyone with a serious health risk. Luckily, AdvantaClean is here to provide you with a number of affordable options for professional basement cleaning, weatherproofing, and moisture control services. Contact us today, and we will create a personalized plan for your home or business! WHAT CAUSES ATTIC MOISTURE BUILDUP? Attics can be the most tucked-away area of any home or workplace – it’s easy to overlook the storage space on cleaning day! However, it is necessary to properly clean and ventilate your attic to ensure the air quality of your home or workplace. The HVAC ductwork system and insulation are usually found in the attic. Because these are the most important components of a home or business, it is even more important to take preventative measures so that your attic stays clean, and mold-free – it will make a difference in your health and overall air quality. AdvantaClean offers many tools and cleaning solutions to create effective attic moisture control. We’ve been proudly performing successful attic inspections and cleanings for more than twenty years! ATTIC MOISTURE CONTROL: WHAT WORKS? In order to avoid any serious safety or health issues, your attic needs to be thoroughly cleaned on a regular basis. Unclean attic vents, improper attic insulation, and a lack of attic ventilation put everyone in your home or business at risk. Properly cleaning your can be difficult and time consuming, which is why AdvantaClean is proud to offer a professional attic cleaning. We’ll take the time so you don’t have to! Your ductwork, plumbing and other integral systems are all found in your attic, making regular inspections of these features important to the safety and health of everyone in any home or business. Attics are usually found at the very top of any building; since heat rises, these spaces frequently become hot and humid, especially in the summer. Because your attic is also the closest room to your roof, it is more prone to precipitation than any other room. AdvantaClean will work with you to create a plan to keep your attic properly weatherproofed and free of any harmful moisture. Here at AdvantaClean of Oklahoma City, our skilled team members are able to diagnose your moisture control needs quickly and efficiently. From there, we will work with you to create and implement each individual corrective action that is necessary to ensure the absence of mold and mildew in your home or business! Edmond crawl space moisture control solution experts! Call Us Today – (405) 896-7159!